L.W. 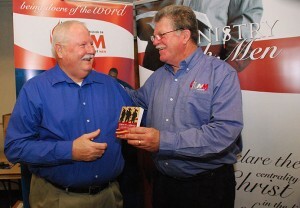 Smith (right) presents a copy the of the “Strength for Service to God and Community” devotional guide to Daniel B. Ramsey during a meeting of United Methodist Men in Nashville, Tenn. A UMNS photo by Tom Gillem. Each day’s reading, which includes a Bible verse and prayer, describes incidents that are familiar to emergency personnel who respond to tragic events. The Strength for Service for God and Community books are expected to be presented to the Connecticut first responders this spring, said L.W. Smith of Columbia, S.C., who serves as task force chair for the project. Local United Methodist men’s groups will make copies available for distribution to other emergency personnel around the United States. A 15-year-old Boy Scout from California, who had seen his grandfather’s copy of Strength for Service to God and Country, worked to get an updated version of the book published as his Eagle project, which was completed just before the terrorist attacks on Sept. 11, 2001. Individual copies of Strength for Service to God and Community may be ordered through Amazon. Tom Gillem is a freelance writer and photographer in Brentwood, Tenn.